Despite our water problems which continue this morning, it was a pretty successful weekend. The campground was pretty much full although we still had a few empty single night spaces, and even some for two nights. But the weather was perfect. Sunny and slightly warmer than forecast...highs of around 25C (77F) so we couldn't have asked for better in that department. And we topped it all off with a fireworks show last night! 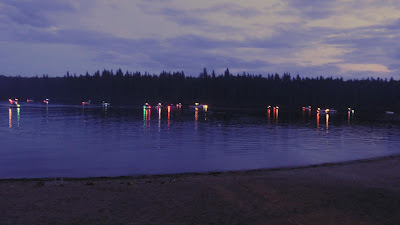 We have a special events committee here on the board of directors and they looked after the fireworks from start to finish so we only had to clean up the beach area this morning after the crowds left and even that wasn't much work. 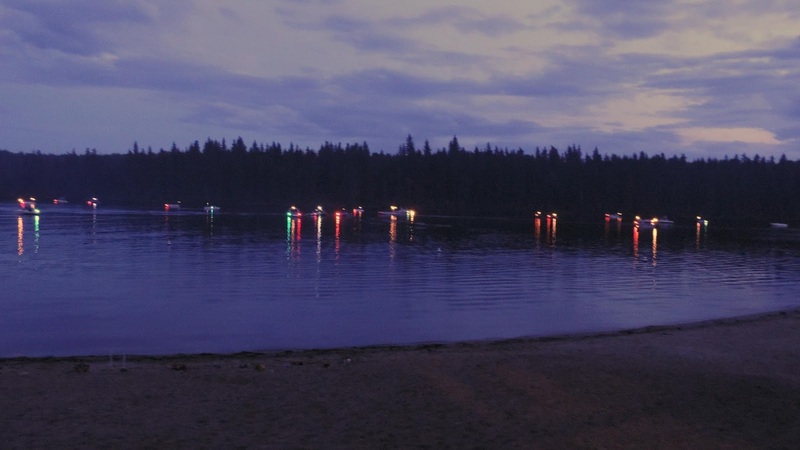 A lot of boats on the lake came from nearby cabins to watch the fireworks. Definitely impressed with the camera. The ones with the black night sky were taken on the "fireworks" setting, and the ones with the bluer sky were just me messing around on some other settings. Little bit different effects. So, still having water problems. I've got the whole story now, and of course this is our first year here so we didn't know much of the history but they've had their share of water problems here at the park. They used to take the water directly from the lake but they were spending a fortune in filtration and figured digging a well might be better in the long term. So this well that we're on is brand new and nobody knew that it wouldn't be able to keep up. I guess they should have had some kind of backup plan, but like anything else hindsight is 20/20! So this morning we had zero water. None. We do have two old fashioned style outhouses, so it's not a disaster. People will survive! But we also went and filled up a couple of rubbermade garbage cans with lake water and put them by the two flush toilets. We'll see if people are smart enough to figure out that's what it's there for! In the meantime, there are no showers so I'm sure some people are distressed about that but there's nothing we can do until the water truck arrives to fill one of our 1,200 gallon tanks. That should last us for a few hours!! Sounds like the park just needs a second 1200-gallon tank. With low mid-week demand, even a slow well should have plenty of time to top off both tanks by the weekend. As crazy as it sounds they have a second 1200-gallon tank but they don't use it, something about it not working properly. Not quite sure why but they are only using this one tank. The original one is lower down, so for now Kevin is slowly filling up this second tank during the week and should we need to use that tank we will have to get a portable pump to pump it into the tank being used now. So hopefully we won't have this problem again. I think that camera is a keeper. Great fireworks shots! Wow what are they going to do long term about the water problem? Sounds like the well wasn't deep enough or they need two wells. That's some big bucks either way. The camera is definitely a keeper, Kevin is quite happy with the way the fireworks turned out. Can't wait to use it on the wild animals in Africa this winter. I think you are right, that this well isn't deep enough. They had a second well until last year when they had to fill it in and there is talk about drilling another one so hopefully that will be in the works for the fall of this year or spring of next year. They used to do that but the lake water has too much sediment in it and if it wasn't filtered it was clogging up all the pipes and also costing them a fortune in filters also there is probably some kind of law out there now that won't allow it. As it is they have signs up for the water here at the park to not drink it unless it has been boiled first. nice photos of the fireworks! sorry to hear about the water issues..can make a camper's life a bit difficult but it could be worse! Hey you survived the grande weekend. Congratulations, water or no water. Well done. Your fireworks shots are great. Yes, we did survive, thankfully! Only one more big weekend to go and after that we start cleaning up the park and putting it to bed for the winter. Not much longer now!